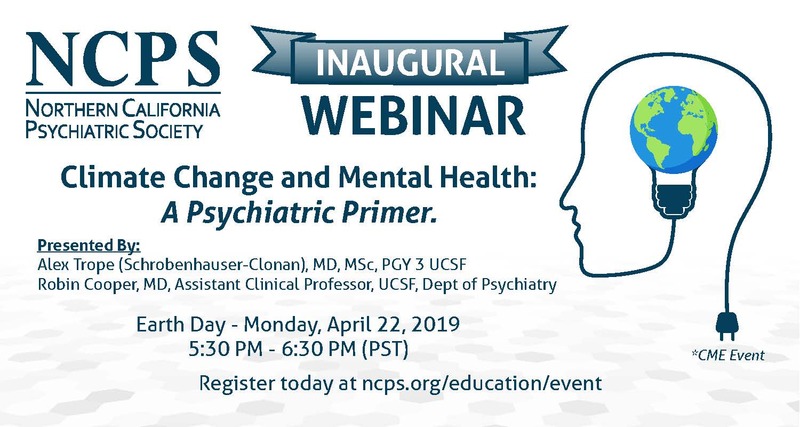 On Earth Day, April 22, the annual day dedicated to the recognition of environmental protection throughout the world, Northern California Psychiatric Society will launch its webinar on the psychiatric and mental health impacts of climate change. Drs. Robin Cooper (Senior Psychiatrist in San Francisco and long time NCPS member and Alex Trope (UCSF PGY 3), both members of the steering committee of Climate Psychiatry Alliance will present an overview of what all psychiatrists should know about climate disruption in their presentation entitled, “Climate Change and Mental Health: A Psychiatric Primer.” Participants will leave with a firmer understanding of how this immense topic specifically relates to their line of work and the opportunities for engaging in the evolving discipline of Climate Psychiatry. Climate instability and global warming have been identified as the greatest threat to public health of our generation (The Lancet, 2015). An ever-growing evidence base demonstrates that mental health is profoundly impacted by both the acute and slow-moving disruptions of people and places associated with climate change and unsustainable global economic processes. The numerous recent severe weather disasters have made the urgency of climate change very clear.